This is one of the first purees that I made for the kids when they were babies and they both always ate it with sheer delight. Funnily enough, they still love it now. Why buy pre-packaged apple sauce at the grocery when you can quickly make this naturally sweet and healthy version. The pear and cinnamon make this more than just a puree. 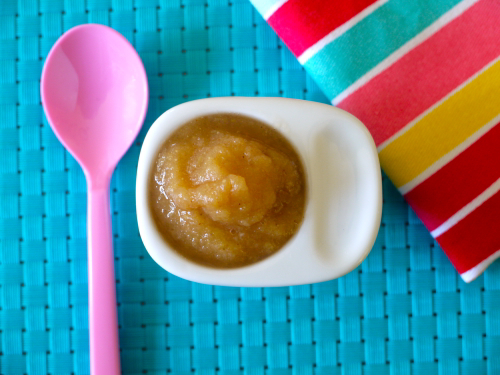 Whether you serve it for breakfast, in school lunch or even as a quick snack, this Pear Apple Butter is a good one no matter what your age! 1. Place apple in steamer pot over boiling water and cook for 3 minutes. 2. Place apples, pears and cinnamon in food processor and puree until smooth. I wish the recipes on the website said at what age you can start to introduce them. This one seems like it would be fine quite young, but I have questions about the others. Just a suggestion. I gave this to my 7-month old baby and the first time he tasted it, he didn't like it all that much! Haha! He's used to the sweeter taste of mangoes and sweet potatoes so this must have been a surprise for him. But I persisted and gave it again to him the next day...and he ate it without any problem. :) It's really true that we shouldn't give up on giving a food to our baby just because he/she didn't like it the first time. I'm glad I made him taste it again so now he's learning to eat food with different flavors. I'm a happy mommy. :) Thanks, Catherine! Can't wait to try this with our Bountiful Baskets apples and pears!